Birkhall's Miscellany: EARTH HOAX; Can We Doubt the World Map? We're living in a strange time. Though there is still legal and governmental authority, there seems to be no real intellectual or moral authority (maybe this was always the case?). It's difficult to know what to believe. I have few answers and plenty of questions. 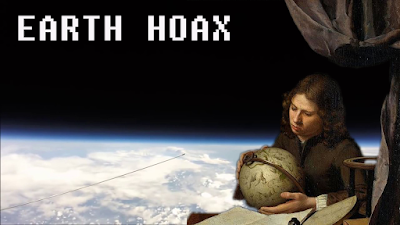 The Flat Earth Renaissance exposed how little we all know. None of us have a clue really. We thought we knew a lot of stuff, but we had misplaced faith. Me, personally, I've returned (like many others) to firsthand, first-person experience. What do I know? What can I prove for myself without simply accepting the word of others? I'm now a little bare. I have less knowledge, but better foundations for what I do have. I genuinely stand open-minded as to the nature of the "world" we live in. The result is that my canvas on which my previous worldview was painted now has a lot more blank space. Speculation now fills these gaps ..that is what follows. I'm now of the opinion that most of the "space exploration" we see on TV and elsewhere is propaganda. For what purpose I'm unsure, I may speculate on that another time. Consequently I now doubt the images and footage we've been shown from space. Once this footage is taken from the table then it follows that the map of the world itself - which we all have imprinted on our minds - can also be doubted. My certainty that that was an accurate representation of the lay of the land rested firmly upon this certainty that it had been viewed from space. We could actually see that it was true. We had absolute certainty - so much so that we didn't even think to question it. It was as real as the world we see in front of us. But without this view from space what else do we have? Is there anyway I can reaffirm this view without resorting to NASA & Co? Now at this point I should probably address the people that may be reading this right now who are thinking how odd it is that someone would believe it even possible that the entire Space Race could be one huge conspiracy. To those people I would ask one of two things. Either, if the interest takes them, to go and do some of their own research into the authenticity of the footage we're shown from space before reading further - YouTube videos may be helpful ;) . Or, if it's too much of a stretch to even consider the possibility that reality may be so askew, then to simply view this whole text as an exercise in epistemology. A thought-experiment of sorts, designed to re-assess our worldview. An audit of our collective and individual knowledge regarding the world map. Even if I'm completely barking up the wrong tree by questioning the integrity of NASA and their friends this project may still be useful in pointing out other anomalies or areas for research. Well, to begin with I have firsthand experience of the place that I live and the places I've travelled (admittedly not very far). I can be fairly certain that the map is accurate in regard those places and their distance/direction in relation to each other. But what about places further afield that I've never visited? Let's say Paris. Now although I've never been there myself I do know people that have, so I have secondhand evidence from people I trust. I also have endless streams of secondhand evidence from other sources - TV, social media, books, etc - and although this isn't as good as firsthand experience, I do have plenty of it, and it would be foolish to doubt it. I'm also safe in the knowledge that I can hop on a plane, or make a few train journeys, and check it all out for myself. Were Paris to be somewhere different on the world map in relation to England, or to not even exist at all, it would need thousands and thousands and thousands of people lying or misrepresenting things on a daily basis for this untruth to endure. To question such a thing would be to question the very nature of reality itself. A wander into philosophy that I'm not really prepared to make at the moment :) I'm happy that England and France are very much real and accurately depicted on the world map in relation to each other - and in relation to me. However, what about places even further afield? What about the deepest, darkest Amazon? Or parts of Central Africa? How much knowledge do I have about these places in actuality? How much secondhand experience do I have? Certainly much less than I have for Paris. Can I check these places out for myself through travel? Most probably yes, but it would no doubt be much more difficult and expensive. Is there a commercial plane flight? Would I need permits and Visas? What about places that few people live or have ever visited? Or places with military restrictions? What about Antarctica, or North-Eastern Russia, or Islands in the Arctic Ocean? Now we're getting somewhere. How certain can we be that things aren't being misrepresented in such far flung places? How many people would need to be involved in such a misrepresentation? Now, of course, I'm not saying these places don't exist, or that they're most definitely being misrepresented in someway, but what I am pointing out is that I have less secondhand knowledge and zero firsthand experience of these places. So I simply can't have the same certainty I have as I do when it comes to places closer to home. It becomes reasonable to question what I know, and what others claim to know, about these places. We assume the world map is %100 correct, but how certain are we? We believe we live in a globalised age and that the world has truly opened up to us. We can walk into a travel agents or an airport and almost without thinking begin a journey halfway across the world. We've never felt so free ..but what we're blissfully unaware of is how truly proscribed these choices are. You can only really go somewhere if there's a flight to that place. What seems like endless choice is in reality just a choice between the places you can go, excluding the places you can't. An average holidaymaker may choose a predictable vacation to sunny Spain or the Caribbean. A more adventurous person, with a thirst for real travel, may opt for Nepal, or India, or some other exotic location. Seemingly endless choice, but what if you want to go somewhere where there isn't a commercial flight or package deal? What if you decided to make your own way there? What would you think if you weren't allowed to visit that place or make that journey? Would you question it or just accept the restriction and move on? How much certainty can you have about, let's say North Korea, when you're not allowed to visit and most the information you have comes from the TV and a limited number of other sources? In this series of blog posts I'll be questioning such things as this. Hopefully it'll be an interesting and worthwhile exercise. Feel free to join me.